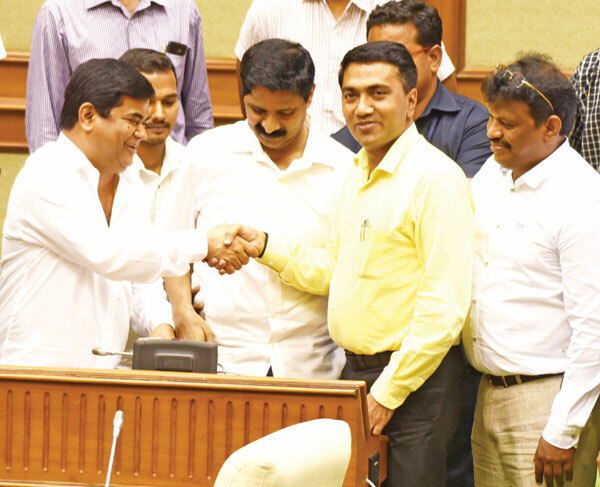 PORVORIM: Following two days of political drama, Chief Minister Dr Pramod Sawant on Wednesday proved the majority of his BJP-led government in the Assembly, comfortably winning a floor test in the House. Twenty MLAs voted for the motion of confidence, 15 voted against it. Besides 11 members from BJP, three each from Goa Forward Party, MGP and three Independents supported Sawant during the head count conducted in the House. All the 14 MLAs of Congress and one from NCP stood up against the motion. Cumbharjua MLA Pandurang Madkaikar, who underwent brain surgery after he suffered a stroke last year, was also present for the proceedings in the House, while Congress’ Luizinho Faleiro, who is AICC in charge for the North Eastern States was flown in by a special flight to Goa for the floor test. Goa Governor Mridula Sinha had convened the special session of the House with a single point agenda to conduct the floor test, after Sawant was sworn in as the CM during wee hours of Tuesday. The session was presided over by Deputy Speaker Michael Lobo. After winning the trust vote, Sawant appealed to all the members to join hands with him to ensure that developmental work reaches every nook and corner of the State.“I appeal to all the members of the House let us all join hands to work for the betterment of Goa. I am a normal worker of the party and will strive to take the schemes of the government to the lowest level of the society,” he said addressing the House. Later speaking to the media, Sawant said he was confident of sailing through the confidence motion. “I was 100 per cent confident of winning by 21-15, as the alliance partners MGP, Goa Forward and the independents were strongly with us,” he said. He further said that he will meet Prime Minister Narendra Modi as part of a courtesy visit on Thursday, besides also President Ramnath Kovind and BJP National President Amit Shah in Delhi. This would be his first visit to Delhi after being sworn in as chief minister. His office said that it is a courtesy visit to the PM. Sawant, who was the former Speaker of the Assembly, was sworn in as CM after almost 30 hours of tough negotiations with the alliance partners.